Winemaker’s Notes: Youthful lemon-green in color, this wine shows fresh aromas of green apples, tropical fruit, white flowers, and a hint of almonds. The ripe flavors continue to unfold on the palate, with concentration, depth, and creamy minerality. This wine is a perfect accompaniment for roast pork tenderloin, chicken saltimbocca, or crab-stuffed flounder. 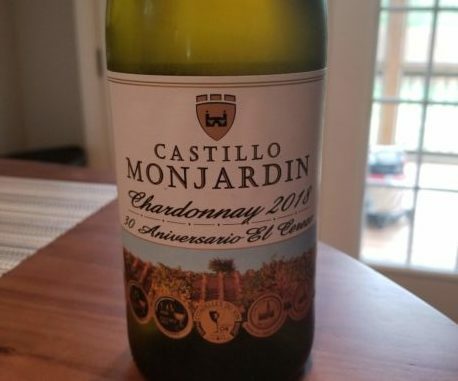 My Review: So, there were a pair of wines from Navarra that were recently sent to me, and I have to admit that this wine was the reason that I accepted the offering—unoaked chardonnay is pretty much the only way I can get my wife to try the grape. In the glass the wine was a light straw yellow, with slashes of lime green when held up to the light. On the nose I picked up green apples with a touch of white flower. In the mouth, however, the wine surprised me. While I picked up flavors of green apple and pineapple, the notes (and the bottle itself) proclaimed that the wine was unoaked; done completely in stainless steel tanks. While I’m inclined to believe this, the wine still showed more roundness than I was anticipating. While it certainly wasn’t buttery, the wine wasn’t as crisp as I was expecting, with more body than what I usually associate with an unoaked chardonnay. For me that was fine; I enjoy an oaked chardonnay, provided it isn’t overdone, but my wife definitely wasn’t a fan of the wine, with it showing more body than she wanted. We opened the wine on a Saturday afternoon, not pairing it with any food, but I could see a good pork tenderloin being a nice option, and crab-stuffed fish may compliment the surprising body of the wine. For $12 it’s a good value, and if you’re looking for a chardonnay with some body that isn’t using oak as a crutch, this is probably a good option for you, especially for the price point. If you want something crisper, you’ll likely want to look elsewhere.